Heat oven to 400°F. Lightly grease bottom and side of pie plate, 9x1 1/4 inches. Stir together remaining ingredients with fork until blended. Pour evenly into pie plate. Bake about 35 minutes or until knife inserted in centre comes out clean. Cool at least 10 minutes. Do-Ahead Tip: Company coming over? Assemble your pie a few hours ahead of time and place it in the refrigerator. Just before your guests arrive, bake and enjoy warm pie right out of the oven. 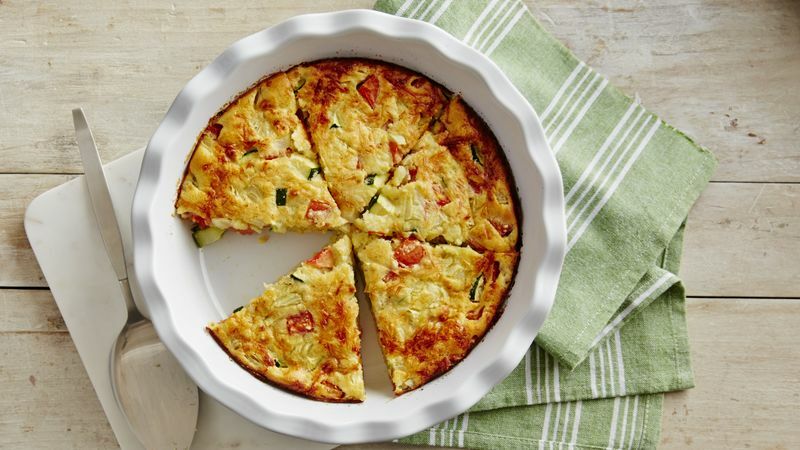 Purchasing: If you have a bumper crop of zucchini and tomatoes--or find a great deal at your supermarket or farmers' market--this is a recipe you'll want to keep handy! It's a flavourful way to use up a bountiful harvest.